The suction handles are easily attached to smooth tiles. Use the suction grip, by pressing down the levers at each end. They are also removed by lifting the levers, this releases the suction. It is so easy to place them in the most convenient position for you. Place each suction pad fully onto a tile and not on any joins otherwise the suction pad cannot grip when the levers are pressed down. Use these handles on any smooth glossy surface such as the bath or bathroom tiles. Non-porous glazed bathroom tiles with a smooth glossy finish are ideal surfaces. The same technology is used to lift large heavy sheets of glass. A single handle or a a pair can easily fit into a suitcase even if travelling by air. Simply release the lever to remove handle. No tools required. The handle works on suction levers, it is very quick and easy to fit. 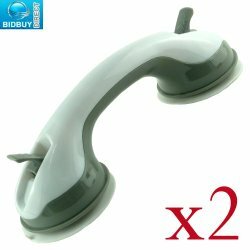 Click Bath or Shower Suction Suction Cup Handles to buy from Amazon I use them in the shower at home, one hand to hold on and keep my balance and the other to wash. Consequently I feel much safer and I cannot lose my balance even when I shut my eyes. Only use the handles on glossy tiles with a smooth finish. Test the suction every time you use them, the suction grip will inevitably weaken after a few days. Periodically it is a good idea to clean the plastic suction grip. It is very easy to reset the suction grips. I use the support grips to help with my balance and never to support my full weight. what a waste of shipping $ and money for these shower suction handles !!!!!!!!!!! !